This is delicious with naan or basmati rice. Soak the kidney beans in plenty of cold water for 12 hours. Mix the lamb with all the marinade ingredients. Cover and chill for 6-12 hours. Drain and rinse the kidney beans. Place in a saucepan and cover with plenty of cold water. Bring to the boil. Skim off any scum and boil vigorously for 15 minutes, then reduce the temperature and add the bicarbonate of soda, garlic, turmeric and chilli powder. Gently cook for 1½ hours, adding extra boiling water as needed, until the beans are very soft, in a thick sauce. Add salt to taste. Melt the butter in a small frying pan over a medium-low heat, add the ginger and garam masala and fry briskly for 1-2 minutes. Mix into the kidney beans. Shortly before you are ready to serve, line a grill tray with foil and preheat the grill. Cut the onion for the kebabs into 2.5cm dice and separate into single pieces. Carefully thread alternate pieces of lamb and onion on to eight 15cm skewers (if using wooden skewers, pre-soak them for 30 minutes in cold water). Brush the kebabs with the oil and grill for 10-12 minutes, turning the skewers as you do so. 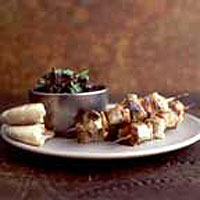 If necessary, reheat the kidney beans and serve alongside the kebabs with a scattering of coriander leaves.